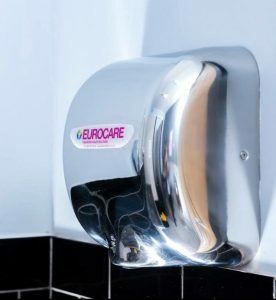 Eurocare can supply only/or hire to your business high quality eco-friendly hand dryers. Our range of dryers are cost effective, low on energy consumption, high performance and incorporate leading-edge technology. Historically hand dryers in public washrooms have been poor on performance and fairly ineffective. The new generation of hand dryers are more powerful, faster, and are completely fit for purpose. 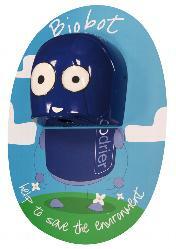 The Ecoblast Dryer is a stylish, hygienic, fast, powerful and cost effective hand drying solution. With features such as a switchable element and a high brightness blue LED light, the unit is our best seller and has been manufactured to maximise on energy efficiency and deliver high performance without high costs. If you are looking for a cost effective solution for your washroom then the Eurocare dryer units take some beating. It uses 90% less energy than conventional dryers and is the perfect green solution for commercial premises such as restaurants, bars, cinemas, supermarkets, tourist attractions etc. To find out more about our wide range of hand dryers please contact us on 02920 868961 and speak to one of our friendly team. The Biobot is a hand dryer that has specifically been designed with children in mind to encourage them to use it every time they visit the washroom. In the past there have been issues with young children using hand dryers in primary schools and nurseries etc. One of the main reasons for this is the loud noise a hand dryer can make when in operation which can often frighten young children. This has led to many schools investing in hand dryers which are not used and money has been wasted. The Biobot hand dryer has been designed to look like a robot and represents a fun and engaging way of introducing the young child to hand drying. The decibel rating is significantly less than a normal dryer and therefore will not frighten the child when in use. Visually, the Biobot has been characterised with large appealing eyes, an engaging smile and a colourful background which represents the remainder of the Biobot’s body. The background is available in two attractive designs, both of which carry the green message of ‘help to save the environment’. The background doubles as a splashback for easy cleaning and maintenance. The Biobot uses 90% less energy than a conventional dryer and is a staggering 98.5% cheaper to install than having to pay for a regular supply of paper towels! To find out more about the Biobot hand dryer contact us today on 02920 868961 and we would be happy to help.